Tromso is known for museums, sightseeing, childrens museums, nature, and outdoors. Your plan includes some of its best attractions: explore the striking landscape at Tromso Fjords, head outdoors with Active Tromso AS, admire the landmark architecture of Arctic Cathedral, and see the interesting displays at The Polar Museum (Polarmuseet). To find reviews, other places to visit, traveler tips, and other tourist information, go to the Tromso tour planner. Use the Route module to find suitable travel options from Santa Clara, USA to Tromso. The time zone difference when traveling from Santa Clara to Tromso is 9 hours. 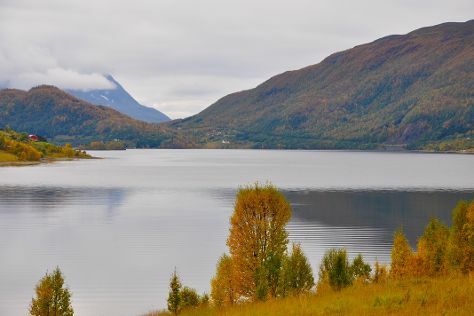 When traveling from Santa Clara in September, plan for much colder days and slightly colder nights in Tromso: temperatures range from 52°F by day to 42°F at night. Wrap up your sightseeing by early afternoon on the 29th (Thu) to allow time for the flight to Nordkapp Municipality. Some 200,000 visitors take a trip to Nordkapp Municipality every year, drawn by its two main attractions--North Cape and Knivskjellodden, considered by many the northernmost point of Europe. On the 30th (Fri), get outside with Knivskjellodden, then get engrossed in the history at Nordkapphallen, and then explore the striking landscape at North Cape. On the next day, explore the striking landscape at Kirkeporten in Skarsvag, take an in-depth tour of Nordkappmuseet, make a trip to Gjesvaerstappan Nesting Cliffs, Nordkapp, then make a trip to Bamse statue, and finally take in the exciting artwork at The Gallery - East of the Sun. To see where to stay, other places to visit, ratings, and more tourist information, refer to the Nordkapp Municipality trip itinerary maker. Getting from Tromso to Nordkapp Municipality by flight takes about 5 hours. Other options: drive; or ride a ferry. In September, daytime highs in Nordkapp Municipality are 50°F, while nighttime lows are 46°F. Finish up your sightseeing early on the 1st (Sat) so you can travel back home.